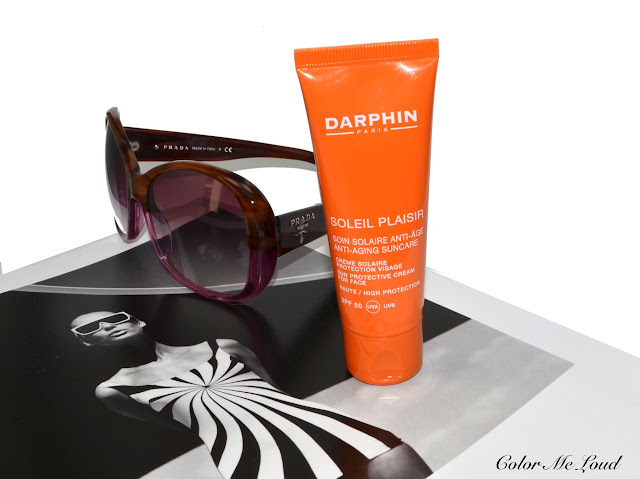 Darphin Soleil Plaisir Anti-Aging Suncare is a moisturizing and sun protective (UVA/UVB) cream for the face. It comes in SPF 30 and 50 options. My skin changes color even under candle light(!) so I went for SPF 50 after trying SPF 30 and getting more tanned than I wished for. Last year I was using Chanel's sun screen and went to the beach house of my parents with that one. Some of the neighbors asked my mom why my face was looking so white. They thought I was ill. Do you get a similar effect when the sun screen sits on top of your face instead of being soaked in? Although I didn't have the opportunity to test Darphin Soleil Plaisir to the beach and check with the same nosy neighbor, I can already see that it looks less clay like, more like a moisturizer which leaves a dewy finish while being absorbed much better into the skin. I try not to read the press information before testing but my observation definitely holds with their claims. It is written that the quick absorption is provided by Karanja, Avocado and Coconut oils. I can also definitely see the dewy finish and moisturizing effect, as the cream is given to contain Hydraulic Acid and Vitamin E too. Since it feels very moisturizing and definitely doesn't look like I am wearing sun screen, I wonder how effective it will be when I go to the beach house. I will definitely keep you posted. Meanwhile it is my go to sunscreen for my everyday life. Office to home and back that is. Definitely recommended for dry skin ladies who doesn't like a clay look on their faces. A few more notes on this, it has a slight white flower scent, it doesn't contain parabens, it is non-comedogenic and given to be water resistant. It is not supposed to be applied around the eye area. It has 50 ml of product and costs around 30€. Next is my new find, which I thought I should review before it is finished. In two months I have used half the bottle. Since the glass is milky you have to look closer at the photo to see, the level of mine is right below the Exquisage print already. Previously I have reviewed Darphin's Intensive Skin Hydrating Serum and told that it would probably be great for combination and oily folks but for me with dry skin, the hydration was not enough. Exquisage Beauty Revealing Serum gives me the right amount of hydration and comes with additional anti-aging benefits. Anti-aging claims are always hard to test but to me Darphin Exquisage Beauty Revealing Serum is a great all rounder. It goes perfect under my foundation since it absorbs fast, leaving the skin smooth and hydrated. At night I can also use it under my cream. This is how I managed to half the bottle. Exquisage is Darphin's new anti-aging line which also has a matching cream which I haven't tested. These are given to have CelluVie™Complex for revitalization with skin-renewing ingredients such as Artemia Extract and Antichoke. The bottle has 30 ml of product and costs around 90€. It is not cheap but regardless it is a candidate for repurchase for me as I am simply loving the texture and the feel of my skin after the application. Final thoughts: Darphin Soleil Plaisir Anti-Aging Suncare brings moisturizer and sun screen together and results in a very pleasant texture which is well absorbed into the skin unlike any other sun screen I have tried, because they usually leave a white cast on the face. I am loving it for everyday use at the moment. 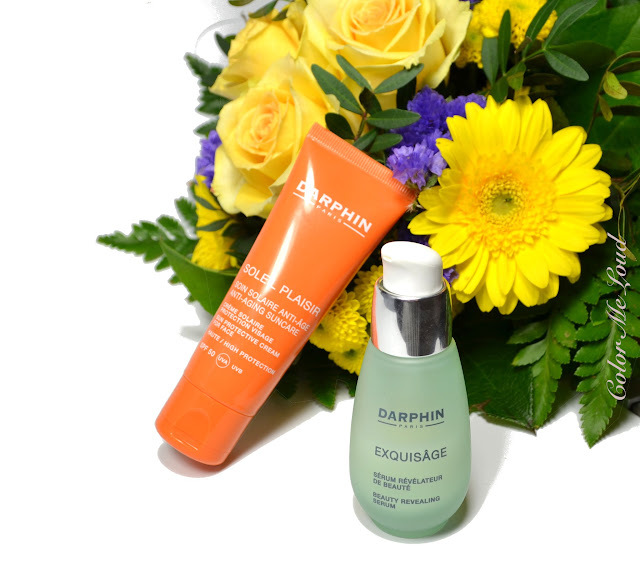 Darphin Exquisage Beauty Revealing Serum is a great all rounder for me, under the foundation as well as under my night cream. It is absorbed quickly, leaves the skin smooth and hydrated. It is not one of the cheapest serums I have tried so far but definitely a very effective one. What is your favorite sun screen for face at the moment? Do you also have the white clay and nosy neighbor problems? Disclaimer: The products in this review were provided free of charge for my consideration. I have mixed feelings about the whitish look of some sunscreens. On the one hand, nobody wants to to look too ghost-like. On the other the sunscreen chemicals as well as the nano-sized mineral barrier ingredients are not so very healthy. I basically alternate between three products: for regular daily use a health food store sunscreen with non-nano minerals (zinc and titanium dioxide) that is light and absorbed rapidly. I will later reapply a foundation with SPF of the same ingredients to renew the protection. For when I am on the beach or driving in summer on a sunny day (when one gets a lot of sun exposure) I'll use a more heavy duty non-nano mineral barrier sunscreen that does look clayish. I just got a liquid bronzer to put over that one to minimize the white cast. For when I am out and about and will get a lot of exposure but am in a social situation where I can't wear the white one, I wear de la Roche-Posay Anthelios which has a uniquely effective ingredient for both UVA and UVB. I learned this from a cosmetic dermatologist. I also use an AM moisturizer and eye cream which contain coffee to repair sun damage as I go. Oh so much love for Darphin!! This is a brand that I've really not explored in great detail... but your reviews sound great! Always so nice to find a lovely serum that absorbs well and just feels good! And LOL at your nosy neighbor's comment!!! Hahahaa.... Oh gosh, massive fail for Chanel! Hey Sarah, sorry to hear you got hit with a weird stomach and big headache. Get some rest, the world won't end if you don't blog for a few days, hope you feel better soon! Ha ha...I had a similar experience with Chanel sunscreen! When I first wore it, a coworker of mine asked me if I was ill! It was especially bad because I use Hourglass Mineral Veil primer and my foundation also has sunscreen. I've now learned to use a thin layer of the Chanel sunscreen, and between the three products my face gets good protection. The Chanel is definitely the best face sunscreen I've used it terms of helping to keep oil at bay, but I'm not sure if I'll repurchase. For that price, I feel like it should be more effortless to use. thanks very much for this insightful comment. For my daily regular use, this cream is great. I am usually in the office but exposed to sun while going to lunch, going and coming back from work, and a little from outside since I sit by the window. You are right though, I might need something more blocking for the beach holiday. The neighbors might complain again but who cares. I might look into a liquid bronzer, do you have a water resistant one to recommend? it seems if you really want to block sun, it might look clayish. But this one is so good for daily usage. It also photographs well, since I am not using flash for that purpose. Big love for it at the moment. About serum, you are right, it should just not irritate, absorb well and weeks smooth and hydrated afterwards. I am always so surprised to see how difficult to find something like that hahaha. Anyway this works great on me at the moment, I will repurchase it. your skin is combination right? Probably the regular Dauphin serum also works on you. now this explains it all. Since I have rather normal to dry skin, I also didn't like how hard it was to apply Chanel's on my face. It literally wouldn't glide. It seems your natural sebum agreed with that more than my skin did though. For everyday use, check out something which doesn't look clayish. I've heard good things about this darphin product.. Going on my wish ♥ list now!.